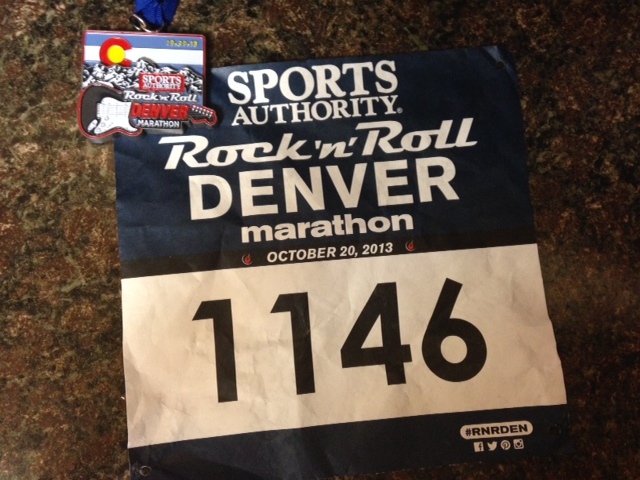 On Sunday, I ran the Rock ‘n Roll Denver Marathon. It’s one of my favorite races, and it’s where I set my PR in 2011, so I had high hopes for this race. 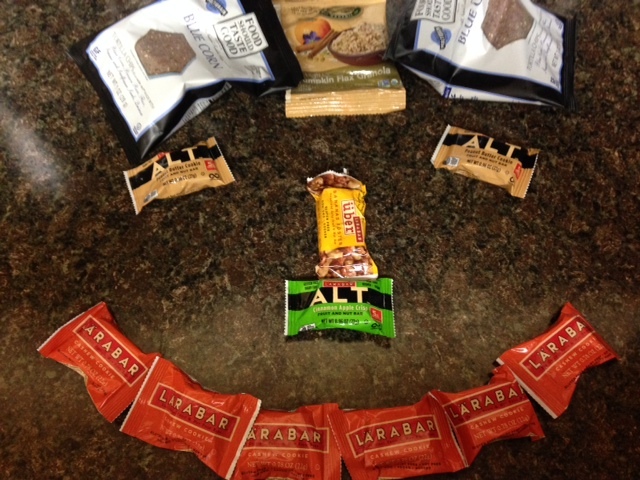 Like most races, I went in with “A, B, and C” goals. At the expo, with all my goals in place. Saturday afternoon, we headed to Denver and hit up the expo, where we got a bunch of sweet freebies (my favorite part of any expo). Swag smiley face, courtesy of my husband. We didn’t spend too much time at the expo, as I didn’t want to spend much time on my feet. After we left, we hit up Barnes and Noble and H&M (which were right by our hotel). This weekend, Denver was also holding its annual “Zombie Crawl,” so we got zombied out pretty fast and took refuge in the hotel. (I’m not sure what the purpose of the Zombie Crawl is, aside from giving thousands of people a chance to dress up and act weird). Later, we had dinner with my BFF Hallie and her husband, then came back to relax and hit the hay early. And not sleep, of course. My alarm went off at 4:30 on Sunday morning. I rolled out of bed, ate my bagel and PB and drank a bunch of water, and went back to bed for another hour. When the alarm went off again, I got up, got dressed, and annoyed Jordan with my nervous energy while he showered and got ready. We left the hotel at 6:15 and walked the couple of blocks from the Sheraton over to Civic Center park, where the start is. We found a secret cove of porta-potties with NO LINE and soon enough got in my corral. This was the first year (of the five I’ve run this race) that I wasn’t pushing and shoving in a panic to get in the corral right at the start. So of course, this year, the start was delayed by 10 minutes. Ha. But eventually, the National Anthem played, the gun fired, and we were off! Not a bad view from the starting line. I’m always amazed by bloggers who can do a mile-by-mile recap of a race. My brain does not store miles like that. I do know that, as always, I hit the first few miles too fast before I settled into my groove. And I had to pee at the first set of porta-johns. I blame the delayed start. And also my tiny bladder. The first half was uneventful; once I settled in, I was pretty close to right on pace. I hit the first half in 1:34 and change — perfect. Shortly after the half-marathon split is a beautiful downhill into Wash Park; I cruised it a little too quickly, but I was glad I did because at mile 16ish, my silly bladder decided that we needed to stop again. Not cool, bladder. And then at 18ish, I stopped to fix my shoe, which had been pinching for several miles and had gotten beyond bearable. At that point, I was just a smidge behind my 3:10 goal, but I wasn’t too worried; I figured I could easily make it up over the next hour. I saw Jordan’s cousin and her husband at mile 19. I was really happy to see them, as evidenced by my smile here. And I didn’t even know she took pictures, which shows how with it I am at mile 19. Anyway, things were going fine until mile 21 or so, at which point the wind picked up. 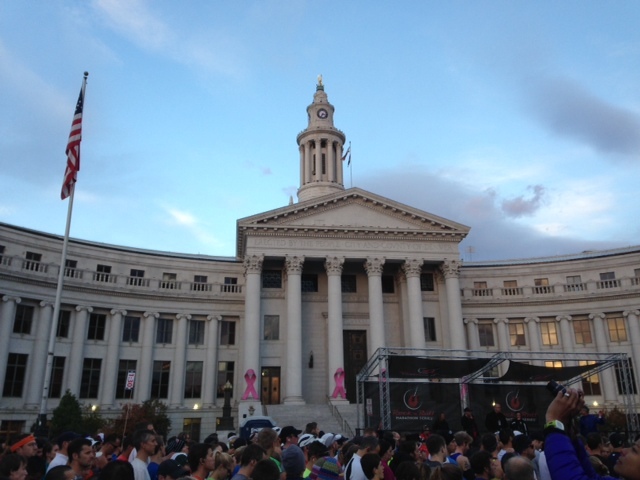 The last few miles are back in downtown Denver, and the buildings created a bit of a windtunnel. It was a headwind for a long time, and my already-beat legs just didn’t have the pep left in them to hold a 7:15 pace against the wind for the last 5 miles. I slowed significantly. I crossed in 3:13:01 — not the 3:10 I was hoping for, but definitely the best race I had in me that day — especially with that wind at the end. It wasn’t a perfect race (is there such a thing?) but it was a great one. 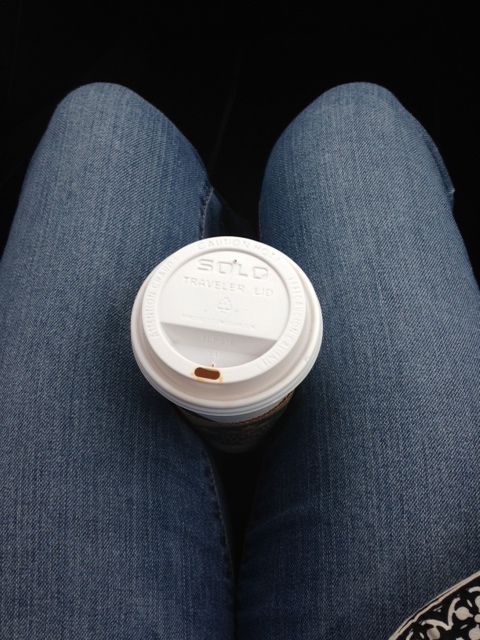 and a pumpkin spice latte for the ride home. The next few days are all about recovery, and then…well, I don’t know yet. Do you make multiple goals for a race? What’s your favorite race story? GREAT JOB!!!!! My friends ran the marathon and lament that hill at mile 25.5 too – I am so impressed by you marathoners – I mean…you finished 2x the distance as me in just 1 additional hour – you are such a badass!!!! Yay! So glad you got a PR! At the Austin marathon last Feb, there was a brutal hill right before the 26 mile marker and David jumped in at the bottom of the hill to run up it with me. I grabbed onto his shirt and hoped that I was allowed to draw some of his energy. Our names were one our bibs and one woman (I never saw her so I have no idea if she was wearing a pink sweater) yelled out “Amy-you are amazing” just as David hopped back in the crowd to get to the finish line. Boy, did it ever help that .2 miles of slight downhill to the finish line go by fast! You are so awesome! And SUPER fast! Congratulations on making top 10!!! You are such an inspiration to me. Congratulations! It was a lot of fun to read about your whole journey to the marathon and your incredible finish. You are seriously AMAZING. I do not know how you do it, but you such an inspiring runner. Congrats on a tremendous race! You looked amazing at mile 19!!!!! Wow! Great job! I’m with you on mile by mile recaps. I barely know my own name during a race. That’s nice there was a downhill finish. Congrats! Even though you didn’t hit 3:10, it sounds like you had a truly great race! You should be so proud! 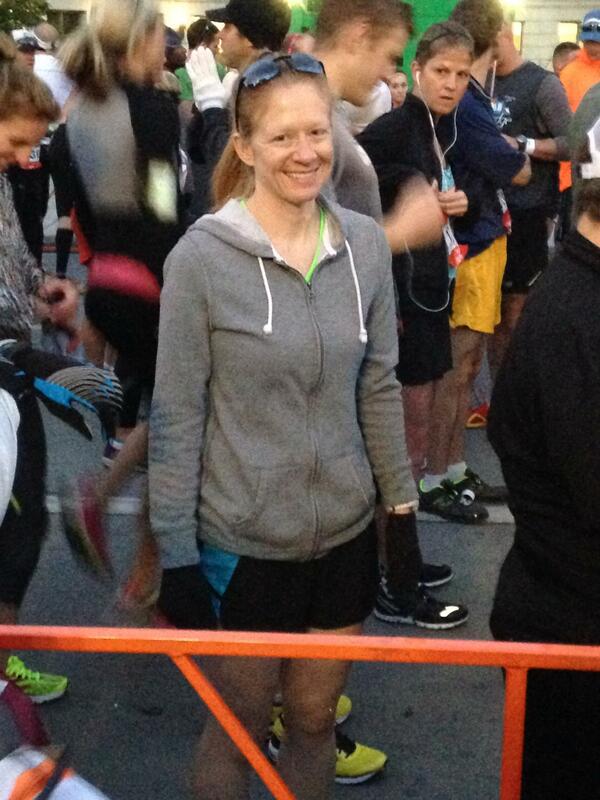 And you look so totally with it in your mile 19 picture. I am impressed. Congrats on the new PR pretty lady! You look so happy in all the pictures that you would think running is super easy! P.S. 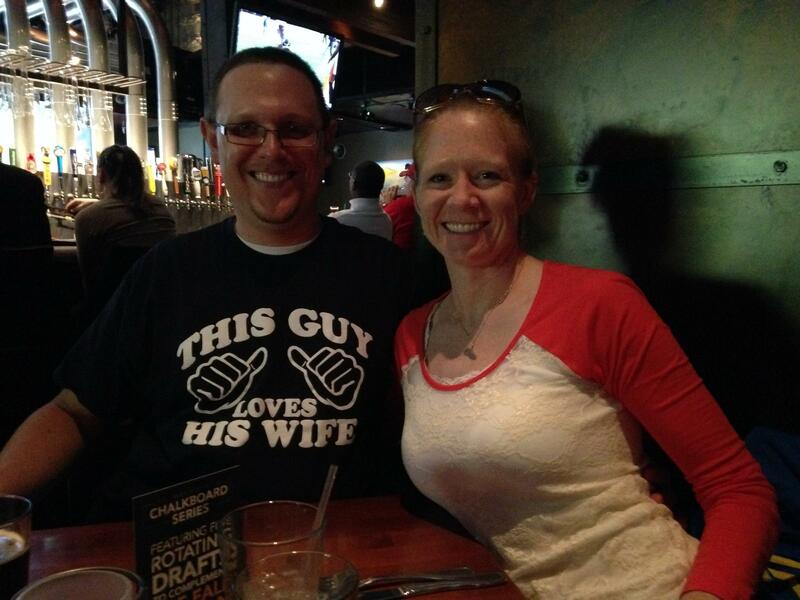 LOVE J’s shirt! Um, hi. You’re amazing. Seriously, sister…major high fives to you for such an amazing race and i LOVE that picture that your friend took of you. You just look happy :). CONGRATS!!!!!!!! I know I am little behind on blogs but CONGRATS ON YOUR AWESOME RACE!!!!!!!! !